The changing relationship between Cuba and the United States will have big ramifications for major league baseball. This story appears in the March 21, 2016 issue of SPORTS ILLUSTRATED. TO subscribe to the magazine, click here. But because next week he’ll become the first U.S. president to set foot in Cuba since Calvin Coolidge, because he’ll be there to promote his 16-month-old initiative to open relations with the Castro-ruled nation and because a ballpark provides the most obvious patch of common ground for Americans and Cubans, Obama’s experience can’t help but be watered down. There will be ceremony and posturing when he shows up for the Rays’ March 22 exhibition vs. the Cuban national team. Smothering security, minutely dissected handshakes, thousands of dull, carefully vetted “fans”: It is ever thus, when high-level pols belly up to the USA-Cuba baseball rivalry. Everyone behaves according to plan. Indeed, the unexpected happened only once, when baseball realized the barrier-breaking potential of “Ping-Pong diplomacy,” when the game’s ability to blow past terms like missile crisis and Bay of Pigs revealed itself like a sudden, breaching whale. For good reason. Jim Abbott was one of a kind, too. This was July 1987, one month after Ronald Reagan called for the Soviet Union to tear down the Berlin Wall. Down 0–2 in a five-game tour of Cuba, Team USA sent Abbott to the Latinoamericano mound for Game 3. Born without a right hand, the University of Michigan sophomore, on his first trip abroad, had been an obsession on the island from the moment he landed. Cubans stared and cheered each time he took the field. Now, when he was introduced, 50,000 Cubans rose for a standing ovation. “I’d never felt like a star like that,” Abbott says. 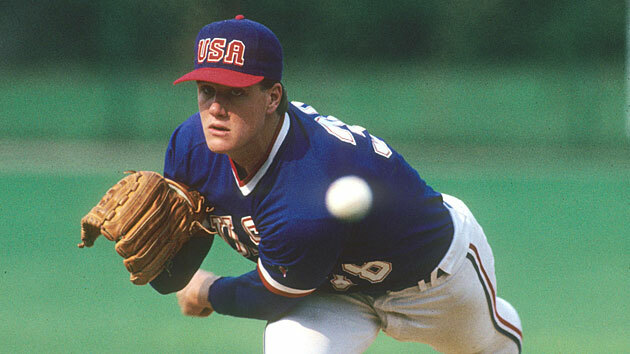 Jim Abbott turned heads and opened eyes during a visit to Cuba in 1987. It didn’t stop there. Two years later, during Abbott’s rookie season with the Angels, a request made its way to the clubhouse: Fidel wanted his autograph. When I first traveled to the island in 1991, not once did a native ask about Havana-born Jose Canseco, then the island’s most famous export. But for the next decade, even as his career faded up north, they all spoke of Abbott with awe. As the president who opened diplomatic relations with Cuba and called for an end to the U.S.’s 55-year-old trade embargo, Obama will inspire similar reverence. His trip to Havana signals a new era, even as the regime’s human-rights abuses continue and upgrades in daily life for Cubans come slowly. Yes, new embassies, relaxed travel rules and baseball games mean progress, but the embargo still largely forbids U.S. citizens from doing business in Cuba—and only an act of Congress can reverse it. Major League Baseball, meanwhile, has been exploring new policies toward Cuban players—if only to prevent trafficking abuses—and has made proposals to the Treasury Department office charged with enforcing the embargo. But with fears over the sustainability of the Cuban league and the regime’s insistence on a cut of player contracts, not to mention MLB’s looming contract negotiations with the Players Association, a resolution that provides a direct, hazard-free Cuba-U.S. pipeline is hardly imminent. S.L. Price is an SI senior writer and the author or the book Pitching Around Fidel: A Journey Into the Heart of Cuban Sports. To purchase a copy, click here.